With the ever increasing competition for student recruitment among higher education institutions, sometimes it seems alumni relations are perceived as somewhat of an afterthought. Sure, alumni have always been valued for their potential as benefactors, rewarding their alma maters with endowments in exchange for some level of personal gratification or symbolic recognition, such as the naming of a building. 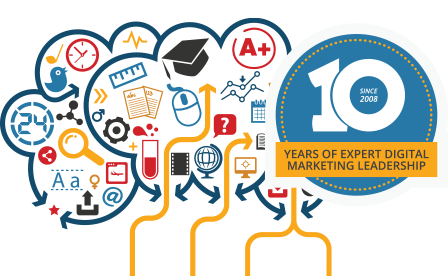 But colleges and universities are beginning to recognize the evolving role of graduates as their most important brand ambassadors, who can significantly impact all aspects of marketing for schools, including student recruitment. Alumni are a reflection of the past, a representation of the present, and a link to the future. 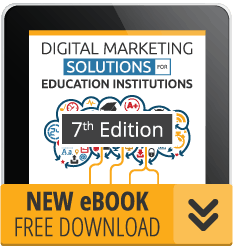 While they remain a critical element of any school’s development strategy, they also play a key role in how institutions respond to the changing expectations of current and future students. Prospective students are more concerned than ever about the value of their educational investment and look to those who have graduated before to see what they have since achieved. Incoming students seek reassurance that alumni will support their career development – essentially leveraging alumni networks to support their own employability. The emerging higher ed goal is to form lifelong relationships with your students, starting from their first experience with the school. College or university can be a life changing experience and many students have an intuitive sense that the inspiration, career and relationships gained from their education signify an implicit obligation to give back when they eventually have the means. With increasingly denser networks the norm, it is easier to access alumni but they must have a reason to connect. Loyalty implies an exchange of value. Mentorship, job postings, or speaking with classes can be mutually beneficial. As graduates start new companies, lead industry change and generally make a name for themselves, they will be more inclined to contribute to the school that enabled their success if that bond has been nurtured over time. This “virtuous circle” can be fostered in the enduring college culture if the proper commitment has been made. Here are some tips to leverage your graduate network. By taking the perspective of education as a lifecycle, you can appreciate that student relations must be mutually beneficial to be sustaining. This requires a college-wide commitment to long-term student engagement, integrating alumni associations with university policy and emphasizing this intention in official communications. Alumni networks can open windows on outside innovations with cross-pollination opportunities, while showcasing your alumni support on your website speaks to prospective students and even influences how current students view their evolving role. Remember that brands are built over time so commit to the long haul. 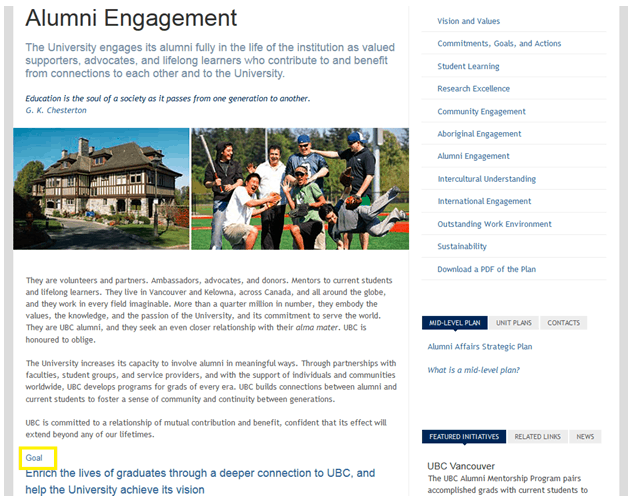 Example: The University of British Columbia (UBC) makes clear its goal of enriching the lives of graduates through a deeper connection to the school with action steps. Alumni engagement can begin as soon as a student enrolls (if not earlier) and extend throughout their lives, with programs provided for all age groups and various university departments, in local clubs and regions with higher concentrations of grads. Offer universal membership to alumni associations and take the extra step to reach out to grads. Alumni associations have been identified in various studies as growth engines for overall institutional support. They are the link between grads and the services and events of their alma mater. Listen to alumni and create resources to support their needs. With many of these associations feeling a financial crunch these days, it is increasingly important to focus on efforts that bring the greatest return on investment. High impact activities in top-tier markets, new technologies to communicate, and efficiently managed alumni volunteer programs are leading this change. A LinkedIn page started by a University of Toronto graduate was taken over by the school’s administration last fall after it became too large for them to manage, but there remains another unofficial alumni page almost double the size, with over 18,000 members. 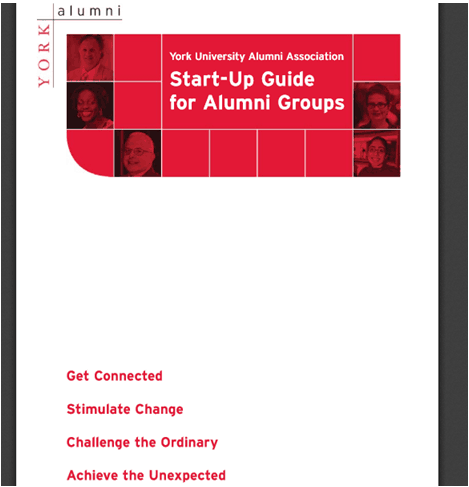 Example: York University’s Alumni Association has developed this helpful start-up guide for volunteers with governing principles, operating procedures, measures of progress and success, and official resources for support. The boom in communication technology has made it easier than ever to connect with graduates, and even re-connect with those who placed themselves on “do-not-call” lists. A 2012 survey by the Council for the Advancement and Support of Education revealed 83 percent of U.S. colleges and universities used social media to engage alumni, with 96 percent on Facebook, 80 percent on Twitter, 73 percent on YouTube, and 68 percent on LinkedIn. The latter can be mined by ambitious alumni outreach programs to determine contact information based on using the school name in search criteria. Active influencers will often be prominent on these networks and can be identified for personal recruitment into alumni volunteer involvement. Many schools are using these resources in creative ways. The University of Waterloo tapped into the Twitter phenomenon by welcoming brand new graduates to join the “alumni club” during last year’s convocation ceremonies. A Twitter wall at the site displayed the tweets of students coming and going from the venue, including congratulations from faculty, friends and family unable to attend. Over 2,000 tweets came from all over the world, while photos and a message board of students’ favourite memories and future plans generated comments by over 1,000 users on Facebook in the coming weeks. UBC discovered their most popular posts included photos of its scenic campus, evoking nostalgia for the pleasant memories of student days. It’s not just young alumni on these platforms either – McGill University has found many of its Facebook commentators are grads from the 1970s and 80s. McGill is a trailblazer in leveraging the success of its newsworthy grads for articles on its many networking sites and alumni magazine. Coordinated messaging through these sites, emails and print newsletters can bring significant turnout to homecoming events, fundraising campaigns or special awards and contests. Their successful “Greatest McGillians Contest” campaign drew over 60,000 votes from 700 nominations. “There’s no way we would have had that much interest if we were relying on the one print magazine that came out during the campaign and a few emails,” said Communications Director, Derek Cassoff. 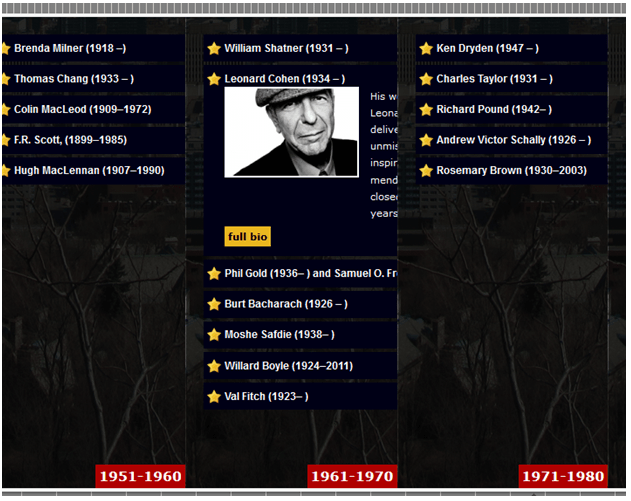 Antigonish, Nova Scotia’s St. Francis Xavier University has one of the country’s strongest alumni networks. Alumni pride is often driven by school reputation and perceived equity of the diploma. St. FX has recent number one Globe & Mail rankings, popular sports teams to lead homecoming events, and a near cult based around its X-ring, received by grads. In each year’s convocation address, president Dr. Sean Riley says, “If you fall, a fellow Xaverian is there to pick you up.” The university has a particularly effective webpage for alumni to support the recruitment effort. 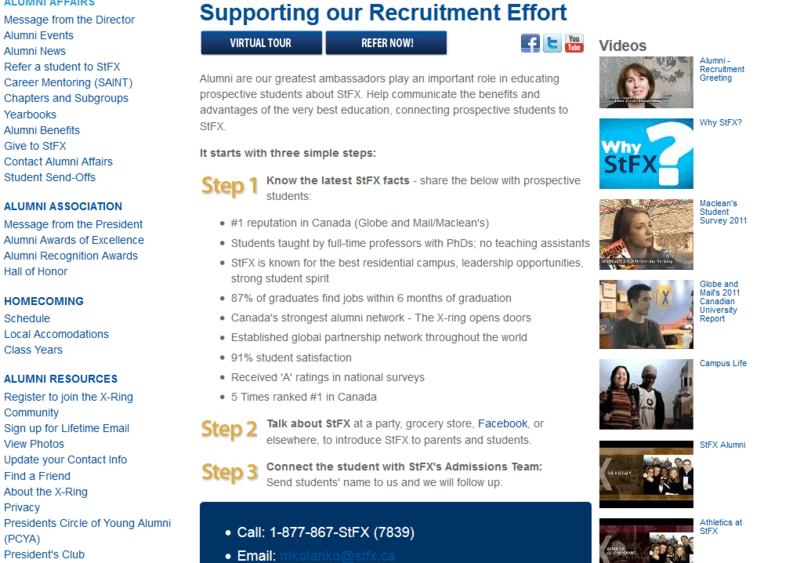 Example: The alumni student recruitment page offers a virtual tour, a form for instant referral that staff will follow up on, and three simple steps to become involved. Data measurement through quantifiable goals and analytics-driven evidence ensure that your efforts are producing results. Develop measurable outcomes, such as increasing e-newsletter open rates to 20%, sponsors for printed letter, or participation in special events. Making alumni relations a long-term priority will bring benefits to student recruitment and all aspects of an institution but using objective measurements will ensure that you are getting closer to your goal. What have been your most effective tools for alumni engagement?